Looking for 1886 Blend Teabags? Inspired by the type of tea enjoyed in Victorian London when Walter Whittard opened his first shop, we've blended whole leaves from Indonesian Camellia assamica tea bushes with those processed using the CTC (“crush, tear, curl”) technique, creating a hearty, full-bodied and flavoursome brew. Our expertly crafted 1886 Blend has a real taste of authenticity – moreish and malty, we love it with a splash of milk at breakfast. Absolutely fantastic alternative to your traditional English Breakfast. A touch of sweetness and a lovely robust body; if I had to drink one tea for the rest of my life it'd be 1886! Love this tea, it's much nicer than your normal breakfast tea. Smells amazing. Delicious morning tea. Flavours of Autumn, fruity and deep. A quick-to-brew treat to start the day. With sweet notes and a smoothness that resembles Puerh this is a fantastic black tea for your your everyday life. Delicious breakfast tea with a strong body, one of the best I've tried. An excellent black tea, rich and ideal for starting the day. So much more than your average breakfast blend. This fantastic tea knocks the spots off the good old English breakfast for me. It's depth of flavours and strength is a clear winner for the best brew of the day!! An interesting twist an a traditional english breakfast tea. Extremely similar to the breakfast tea but with slightly different aromas. This tea is great if you fancy mixing it up for afternoon tea! I will admit I am a bit of a traditionalist and will be reverting back to a Breakfast Tea at 3pm, however I will happily switch for an 1886 every once in a while. I particularly enjoy offering this tea to guests that are also Breakfast tea fans, it is nice to see other similar options out there. This is a classic tasting black leaf tea. It's the perfect upgrade to your old tea bag tea. It has a lovely bold, deep flavour with a hint of floral tones. It would make a perfect breakfast tea to get you going in the morning, or I think would pair wonderfully with a sweet treat in the afternoon. Whittard's 1886 is a very nice black tea. It brews quickly, it's not too rich and it packs plenty of flavour and texture. Great with half a spoon of sugar. A four minute brewing time is perfect for this blend. 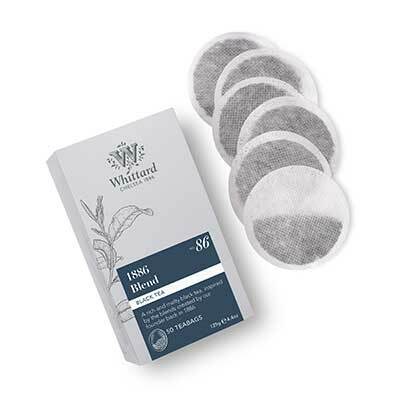 Highly recommended for all fans of black loose leaf tea. Warming golden brew, but be very careful with your timing as it can overbrew fairly quickly. A well rounded blend without an overpowering ingredient/spice. Good for when accompanying food as it will work with it rather than take over. As the title says, I don't have a lot to compare it to but it had a much fresher taste to my usual teabags. I enjoyed it. Tried hot and cold brewed. Hot brew was a little light on depth of flavour, overpowered by tannin for my taste. Cold brew lessened tannins and allowed more complex flavours to come through. Not too different from usual tea....but tasted like quality tea, crisp and not too strong. The tea gardens of Java were originally planted by the Dutch in the 1700s. Tea from the region has similar strength and taste to full-bodied Assam, making it perfect for breakfast blends.